The Aquarius and Leo love compatibility in a romantic relationship will cause people to take notice. They will mix the foresight of Aquarius and the creativity of Leo. Their relationship will be full of energy. They will be formidable together. They might compete with each other. However, the Aquarius Leo relationship will never be boring. They are both friendly and will have a successful relationship. They can both be idealistic and very determined. They will both find novel things very appealing. They are both thrill seekers. They could turn life into a game. The planets Saturn and Uranus will rule over Aquarius. The sun will rule over Leo. Saturn, Uranus, and the sun will work well together to make a cycle that will resemble the Aquarius and Leo friendship. They will work together to make new institutions. Uranus is the planet of new ideas and creativity. It will give Aquarius their great vision. The sun will give the ideas they have together life and action. Saturn will keep the projects going until they are finished. Saturn follows up after Uranus has exhausted their inspiration and the sun moves on to give their energy to something else. Aquarius is an Air sign. Leo is a Fire sign. Air will fuel fire and keep it going. Aquarius can definitely keep up with the lion’s action and energy. They can add special effects to that energy. They can accomplish a lot together. The water bearer will be able to use intelligence to inspire the lion’s motivation. They will give them new ideas to put into practice. They will be very stimulating for the Leo personality. They will have a process together of both of them growing and developing personally. They will both help this process for each other. They will both have a lot of interests. Leo will want to be unique. Because of this they will be very happy to carry out the Aquarian’s ideas. They will be somewhat reserved. The best thing about Aquarius Leo compatibility in a romantic relationship is that they are able to make magic together. Fixed fire and fixed air will cover all the situations. Aquarius and Leo in love will think of a new idea. They will plan how to put it into practice. They will start a project and then they will follow it through until the project is finished. The Aquarius Leo relationship will be based on vision and practice. 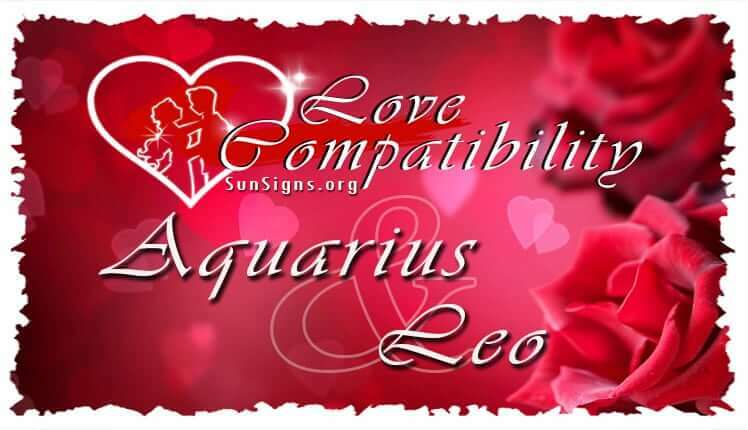 Aquarius and Leo soul mates have a strong compatibility. They can be compatible in romance and in business. They will have a relationship where ideas will become reality. They will both have a lot of respect and admiration for each other. They will have a strong base for friendship. This is important in any successful relationship. Aquarius and Leo are both fixed signs. They will both have a lot of willpower. They are both very personally magnetic. They are both stubborn. At the same time, they are both rational enough to compromise when they need to. This will help their star sign compatibility. They will both stand out in a crowded room on their own, but for different reasons. Leo star sign will work the room in their own regal way. Aquarius will be eccentric and in the corner on their own. When they see each other, they will be interested in each other. They will both have different requirements in love on a trivial level. The Leo man or Leo woman will need to feel that they are adored. At the same time, Aquarius compatibility will mean them having an intelligent bond. However, they can both complement each other. The lion will be captivated by the Aquarius’ ideas, vision, and inspiration. They will be won over by the water bearer having an air of nonchalance about being different. They might want to collect the Aquarius man or Aquarius woman at first the way they might collect a different and unique rock. Leo will find an attraction that runs deeper. The Aquarius personality will be charmed by the lion. They will admire Leo’s easy grace, social skills, and dignity. Aquarius and Leo love compatibility will work well when the relationship is established. They will both be attracted to traits that they do not have but that they will see in each other. The lion is attracted to how unique the Aquarian is. Aquarius is attracted to how warm the Leo male or Leo female is. In the Aquarius and Leo marriage there will have interesting conversations. They will definitely be able to meet on an intellectual level. They will not just have a mental romance. They will definitely have a lot of physical romance. The lion has a passion that will warm up the water bearer who can be emotionally distant. The Aquarius and Leo in bed will meet on more than just a mental level. They will have an interesting and somewhat strange sexual relationship. Aquarius will like to experiment. Leo will not mind taking a chance. They will be compatible when they have to work on everyday things. They will generally agree on things like money management, family life and health. Aquarius and Leo compatibility will have arguments eventually. Leo might decide to act like royalty. They will demand adoration and attention at a level that the Aquarian might not be ready to give. Aquarius has a lot of freedom they will want to keep. They will not want to give that level of devotion. At the same time, they will not expect that devotion to be given to them. The lion will know when they have a partner that they can work well with. Because of this, they will likely not be hard on on the water bearer. They will be very attracted to how smart Aquarius is. At the same time, if the lion is too demanding, an Aquarius Leo breakup is guaranteed. Leo is a fire sign. They will benefit a lot from air signs. Aquarius is an air sign. Fire will need air to be able to burn. However, air does not need fire. Because of this, it is easy to see that Aquarius will have more control in the relationship. Aquarius and Leo being compatible will mean a relationship that is loving and creative and ahead of its time. Aquarius and Leo are both Fixed signs. Leo will give Aquarius the courage they need to push ahead and take action instead of just sitting at home and thinking of new ideas. Leo will be impressed with Aquarius’ original and unique vision. Aquarius dating Leo will both be very loyal and very devoted to each other. They will both need to understand that neither of them has to be in control. They will be able to be successful together. Aquarius and Leo relationship is based on a lot of admiration for each other. Leo will respect Aquarius’ vision, creative and individual nature. Aquarius will respect the lion’s excitement, charisma, and dignity. The Aquarian will always have new ideas. However, they do not always have the motivation to put their ideas into practice. The Leo born can help the Aquarian with their ideas. They will both be proud of their freedom. However, they might have arguments if Leo seems too demanding or if Aquarius seems too distant. They will both need to respect each other’s differences in the way they view life. Aquarius might think that Leo is too dramatic. Leo might think that Aquarius is too unsteady. They will both need to communicate to each other that the relationship is important. The Aquarius Leo compatibility can lead to a successful relationship.